Readers of Stereophile need no introduction to Bryston, a venerable Canadian electronics manufacturer known for the quality and reliability of its amplifiers and preamplifiers, and for its unique 20-year warranty. In the past few years, Bryston has ventured into digital audio with notable success, producing D/A converters, multichannel preamplifier-processors, and music-file players. While an evolution from analog into digital audio would seem logical, their most recent expansion, into loudspeakers, is more surprising. Apparently, James Tanner, Bryston's vice president, designed a speaker for his own use, and it turned out well enough that the company decided to put it into production. Sometimes it all comes down to the shape of the side panels. 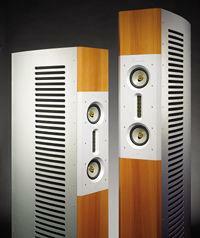 I was smitten by the gentle curves of the Burmester B99 loudspeaker's aluminum side grilles, which have uncommon grace. A love affair with an enclosure? Well, yes. After all, beauty is an intensely personal matter. In the words of Burmester's motto: "Art for the ear." It's always fun to visit the Burmester Audio suite at the annual Consumer Electronic Show. Founder Dieter Burmester and CEO Udo Besser are upbeat, fun-loving personalities who enjoy demonstrating their latest home audio gearthat is, when they're not working on the latest updates to their sound system for the $2.1 million Bugatti Veyron 16.4 supercar. 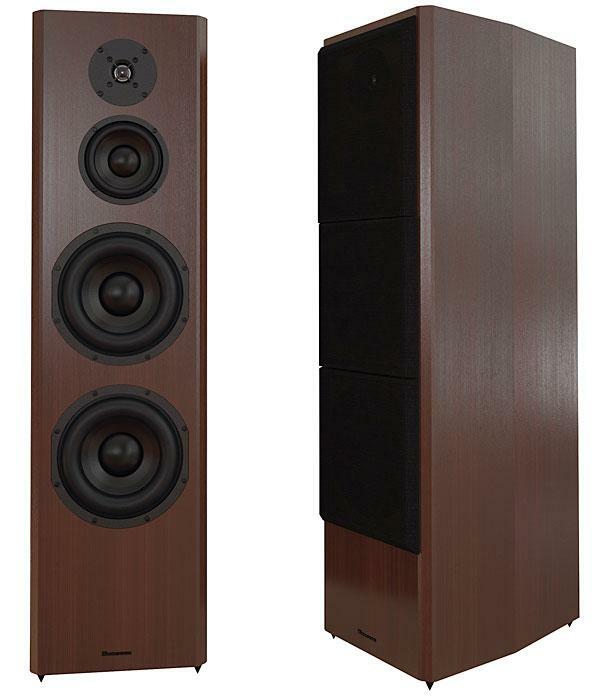 This past year they introduced their new B25 loudspeaker, an 88-lb floorstander. This "baby" Burmester's suggested retail price of $12,000/pair is only one-sixth that of Burmester's flagship speaker, the B100, only one-fourth its weight, and half its height. The design goals for the B25 were a less expensive, lighter speaker that was easier to set up, while retaining Burmester products' high-quality sound and good looks. Playing my own CDs through the B25s at the 2008 CES, I found them notably smooth and detailed; they also imaged well, and were particularly good at reproducing male voices. 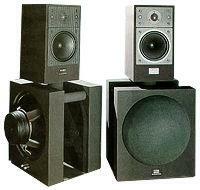 A proper speaker installation can take a full day and sometimes part of a second, even in a familiar room. But by the time the sun sets on Day One, the system should be almost there—wherever there is. 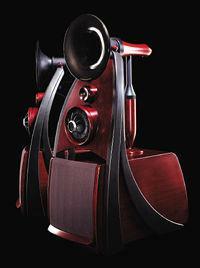 Of all the components to be seen and heard at an audio show or in a dealer's showroom, the most memorable and attention-grabbing are inevitably the super-speakers—bogglingly expensive, filled with cutting-edge engineering and exotic materials, of mammoth size and weight, with full-range reproduction that shakes building foundations and extends far enough up top to disrupt the navigation of bats. Survey the field, and the biggest Wilson, Aln, JMlab-Focal, Burmester, EgglestonWorks, and Nearfield Acoustics models, to name a few, fit that description. Despite my 26 years in audio journalism, the amount of stuff I need to know seems to increase faster than I can cope with it. Thus it didn't come as too much of a surprise for me to learn that speaker manufacturer Canton, the Teutonic equivalent of England's B&W, a) was 30 years old in 2002, and b) claims the dominant market share of the German market. Yes, I'd been peripherally aware of Canton through the years, but for various reasons had never auditioned any of their models. 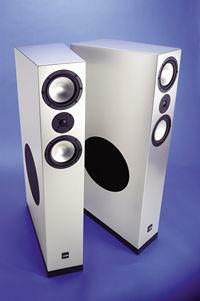 I was amenable, therefore, when Canton USA's Paul Madsen suggested to me last May, at Home Entertainment 2002 in New York City, that I review their flagship speaker. "I have an interesting loudspeaker for you to review," said John Atkinson. What, exactly, is one to make of a speaker named "Reference"? An easy answer might be that it will be expensive. Another easy answer is that someone might be being overly optimistic or downright deceitful. Ambitious? Certainly. Even to a nontechnical observer, someone without a deep grasp of the germane technical issues, the Amazing Loudspeaker should indeed prove a source of amazement. First of all, there's no box. Don't mistake the back grille for an enclosure—if you pass your hand along the Amazing's behind, you'll realize that the grille is merely a cosmetic cover; you can actually stroke the woofer magnets if you're so inclined. Yet without an enclosure or electronic trickery, this speaker boasts excellent dynamic headroom and true flat bass extension almost to 20Hz. Just think of the woodworking costs inherent in trying to coax such low-end performance from a conventional box speaker. The savings in carpentry have been put toward one heavy-duty ribbon design. The Amazing begins to sound like an incredible bargain at its modest (by high-end standards) asking price. What's the catch? Fundamentally, the answer lies in superior engineering. And, as Bob Carver will readily admit, good engineering isn't inherently any more costly than bad engineering. In the audio field, the British have traditionally thought "small," scoring hits both with their compact loudspeakers and with medium-priced amplifiers. 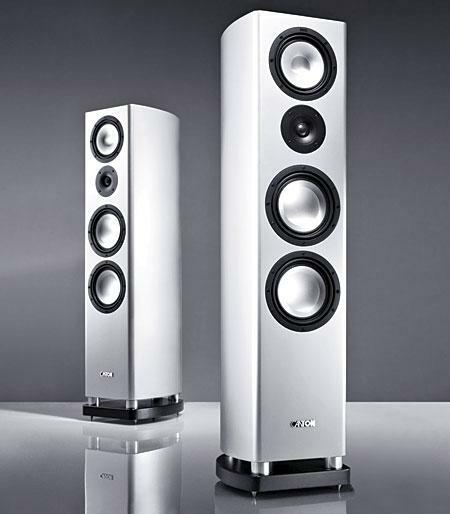 The continued growth of the audiophile speaker market in the US, however, which favors larger loudspeakers, has at the same time stimulated the research and design of more powerful, excellent quality amplifiers. In their turn, these have placed increased demands on the speakers they drive. 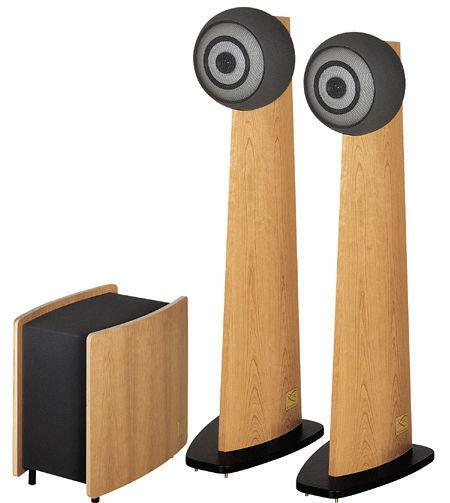 Italian manufacturer Chario Loudspeakers has never had a strong presence in the US. 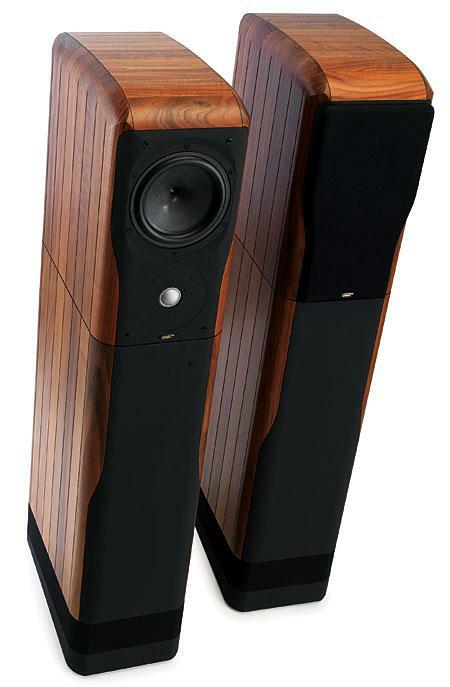 No wonder, then, when confronted by these exquisitely finished beauties of solid hardwood, many American audiophiles think, "Sonus Faber rip-off." Without knowing the musical history of the 1960s, had you heard Badfinger first, you might have thought the same thing when you then heard the Beatles. 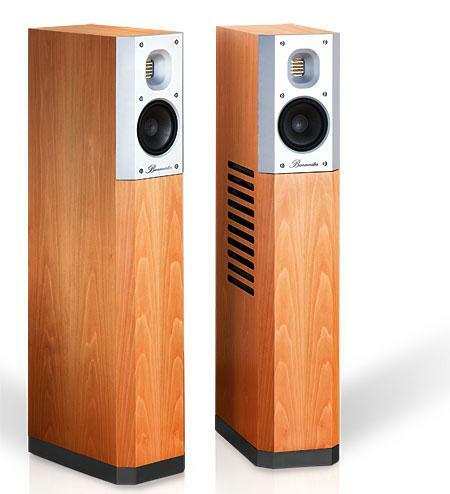 Similarly, Chario, by far Italy's largest maker of high-performance speakers, was founded in 1975, eight years before Sonus Faber. While SF has its drive-units built to its own specifications by other firms, Chario designs and builds its own. Usually, I review a component after it has impressed me at a show or in a store. Though this approach reduces the possibility of a bad review—I pre-select based on real experience—it does not minimize the possibility of disappointment. This makes me a sort of stand-in for the consumer who would like to take something home for a real shakeout, and only then decide to buy it or send it back.